Ivory, the hard, white material derived from the tusks and teeth of animals, especially the mammoth elephant is very costly. It is used in art and manufacture. It consists of dentine, a tissue that is similar to bone. It has been important since ancient times for making a range of items, from ivory carvings to false teeth, fans, dominoes and joint tubes. Ivory has many ornamental and practical uses. Prior to the introduction of plastics, it was used for billiard balls, piano keys, Scottish bagpipes, buttons and a wide range of ornamental items. Whether it is costly or useful ~ it looks good on an elephant and is its body part, not an ornamental piece meant for your display………….. The use and trade of elephant ivory is criminal and controversial, and this has contributed to seriously declining elephant populations in many countries. The Asian elephant preceded its African cousin in becoming part of the endangered species. In Jan 2012, raiders on horse-back charged out of Chad into Cameroon slaughtering hundreds of elephants making it one of the worst concentrated killings since a global ivory trade ban was adopted in 1989. In our own state, there was the poacher Veerappan dealing on sandalwood and ivory. A six-tonne pile of elephant ivory worth an estimated £8million (roughly 74 crores Indian Rupees) has been burnt after Ethiopia vowed a 'zero tolerance' policy towards poachers. The six-tonne pile of ivory consisted of elaborate carvings, trinkets, necklaces and bracelets. Conservationists said 42 elephants were killed between 2011 and 2014, with three killed since January this year. A report in MailOnline states that the stock has been accumulating over 20 years and was mainly made from ivory seized at Addis Ababa's international airport. It included huge tusks, elaborate carvings, necklaces and bracelets. 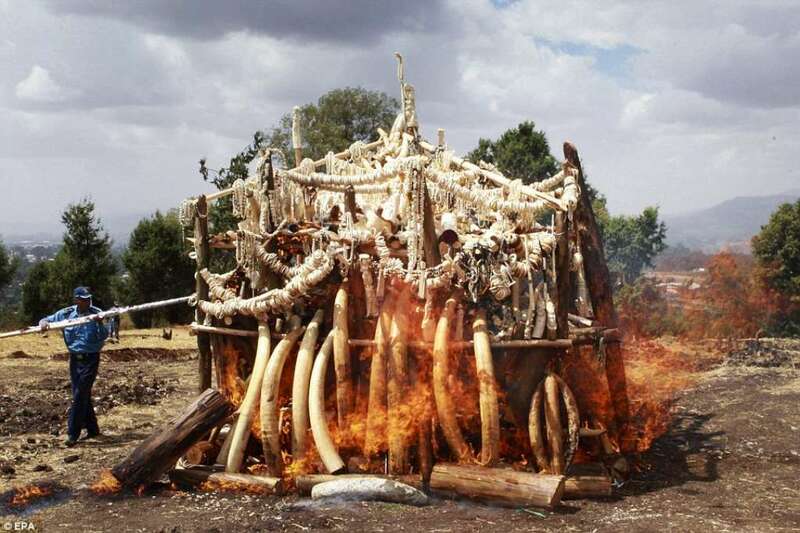 The fire comes two weeks after neighbouring Kenya made a similar gesture aimed at demonstrating renewed commitment to protecting Africa's iconic but dwindling elephant population. The most recent estimate puts the population of elephants in Ethiopia at just 1,800 animals due to poaching driven mainly by demand in booming Asian economies. Some of the ivory burned in the fire at the Gulele Botanical Garden included Buddha carvings. The stock has been accumulating over 20 years and came from elephants slaughtered in the country or ivory seized at Addis Ababa's international airport. Dozens of huge tusks and hundreds of ivory bracelets were part of the stock. From the 1980s, the elephant population in Ethiopia has decreased by 90 per cent. The Ethiopian Wildlife Authority is trying to minimise illegal poaching, but much has to be done. Ian Craig, from Stop Ivory, said the aim of the ceremonial burnings was to make ivory seem worthless. He said: 'This is a rising tide. More and more African countries are recognising that sitting on ivory stockpiles is not sitting on Fort Knox. Wood was stacked around the ivory to ensure it caught fire. It comes two weeks after neighbouring Kenya made a similar gesture aimed at demonstrating renewed commitment to protecting Africa's iconic but dwindling elephant population. The elephants with huge tusks are certainly attractive; Ivory looks great on elephant; – not when they are pulled out goring them to death. The products howsoever, good they may look – should remind us the stark reality of the gory killings behind them. Caesar, one of the heroes of 26/11 passes away !! Mumbai skittles out TN for 87 at Lahli ... yes ! !